St. Xavier's Higher secondary School, Bettiah emerged as the fruit of many years of dreams and discussions. Already in the seventies and eighties the local public, especially the Christian community o Bettiah were requesting the Jesuit Fathers of Khrist Raja to start an Intermediate or degree College in their sprawling campus. They had tasted quality education in K. R. School, and would have more of it in an amplified and upgraded form, preferably with English as medium to meet the exigencies of the time. The Fathers, with their excellent traditions and resourcefulness in the field of education, took up the challenge to provide the people of Bettiah and its vicinity with a C. B. S. E. Higher Secondary English medium based school. Thanks especially to Fr. Lawrence Paschal’s committed leadership and persistent efforts the new school saw the light of day in 1998 in the re-structured K. R. Hostel building. The completion of the splendid new building in 2002 and the successful passing out of the first batch of plus two students in 2005 were definite landmarks in its growth process. While K. R. High School has not lost any of its luster by the emergence of the new school, the latter has carved out for itself a distinct identity on the academic map of Bettiah. It is visible in every area of its life. The name itself St. Xavier’s - conjures up images of great centers of quality education the world over. 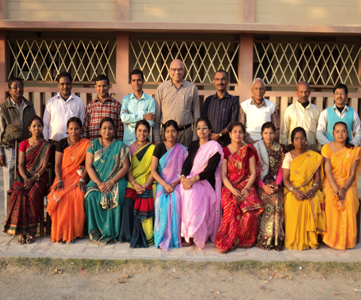 Like all the other world wide Jesuit institutions of learning, St. Xavier’s, Bettiah too has definitely inherited the centuries old Jesuit tradition of service to others which is their hallmark. Education here undoubtedly prepares each student to live meaningfully and lead purposefully. Indeed, the school has tried to live up to its promises right from the beginning: in academic achievement, co-curricular activities discipline and etiquette. Discipline and decent behavior are requirements for formative and value-based academics and the fruit thereof. The school management has, from the beginning, been generous in providing its students and staff with excellent facilities with the aim of bringing out the best in them and if one goes by the facilities and the motivation provided, one can expect excellent all round returns and zero tolerance to mediocrity. It has been a splendid beginning - the first ten years - and as the school grows in maturity and versatility, it also holds out the promise of an ever improving quality of performance towards the realization of the goal of the school: to form men and women of character, competence, commitment and compassion, who can dream and bring about a better world for all. It is a well known fact that K. R. school has been making a significant contribution to the education of the children of north Bihar. Most of the students came from the well to do or middle class families. The Jesuit Fathers and Brothers, who ran this school, felt the urgent need of educating also the poor and underprivileged children living in its neighborhoods. The school acknowledged that it had a social obligation towards these marginalized people. It is in this spirit of serving the poor children of the locality that a school, now known as K. R. Non Formal school, was started. It began in 1972 in a small shed on the campus as an Evening School. It ran till 1976 and was discontinued on account of various problems. Then it was revived as Parallel School in 1995. In the following year it was renamed as what it’s presently known as Non-Formal school. At present it has nearly 750 children from K. G. to the Xth. Over forty percent of the children are girls. The criterion for admission is that they should be from the neighborhood and from poor families. The students of class nine register their names for the National open School System (NIOS) and they write their exam in the middle or end of the following year. Last the first batch of 30 students passed out.